The first printing of Mushihimesama is sold out. Please note the next restock shipment will probably be from the second printing of the game and we have adjusted the price back to its normal level. Thanks. NCS was able to restock a small batch of the first printing of Mushihimesama Futari 1.5 which includes the bonus DLC card to unlock Futari v1.01. Please note updated pricing reflects our higher cost of procurement for this version of the game. 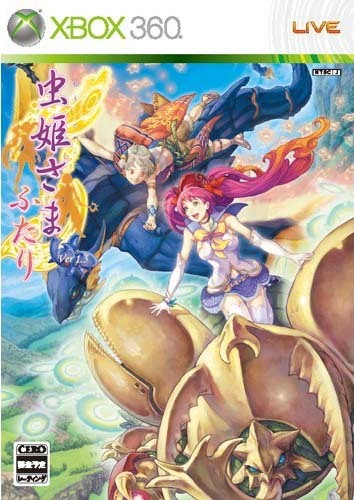 The second printing of Mushihimesama (SKU: 5AD-00004) is back in stock. The second printing of Mushihimesama which we received a couple of days ago is sold out as of the time stamp listed above. NCS expects another batch by next week and we'll update our product listing once the new shipment arrives. Thanks. We have restocked Mushihimesama Futari 1.5 but please note that the game in stock now is the second printing (SKU: 5AD-00004) which does not include the bonus DLC card to unlock Futari v1.01. Thanks for reading. The first printing of the regular edition of Mushihimesama Futari is sold out as of today. NCS will restock the game this week (probably tomorrow) but please note the new shipment will be the 2nd printing which does not include the bonus DLC card. «©NCSX» Copies of Mushihimesama Futari v1.5 (Regular Edition) without the bonus Futari v1.01 DLC card have already been spotted in Japan over the weekend. We had a copy overnighted to us just so we could verify. The new printing of the game has a different product SKU (5AD-00004) and the pink circular sticker isn't pasted on the front cover. NCS' inventory of the game still contains the DLC card but we'll update our product description once they're gone and only the 2nd printing is available. Comparison photos. «©NCSX» Pilot Princess Reko atop her beetle Kiniro or take control of a lad named Palm who rides a dragon known as Hirow and shoot at waves upon waves of insect attackers. The Xbox 360 conversion of Mushihimesama Futari is based on the Arcade 1.50 version of the game but every order shipping today will include a bonus DLC card which unlocks the v1.01 revision of Futari which features different bullet patterns. Mushihimesama Futari 1.5 has the distinction of being one of the most difficult shooters in existence but it's mainly because the bullets from bosses rain down in sheets. Repeat: sheets. Literally, bullets upon bullets. Gamers can look forward to nonstop streaming shots, mesmerizing spiraling shots, and thick waves of rapid shots that afford 1cm of leeway. Even elite players who regularly conquer shmups of all stripes on one measly credit are initially confounded by Futari. We're of the opinion that Cave and arcade operators conspired to make sure that Futari 1.5 gobbles as many credits as possible from average players. Top players might need to feed the beast 2-20 credits depending on individual skill level and hitbox awareness. As mentioned yesterday, NCS is able to process and ship 5/8 or 62.5% of our preorders for the Mushihimesama Futari Limited Edition today. Please note that we cannot accept any changes to preorders as of today. We have a large volume of orders to process and we want to make sure everyone's order is shipped out this afternoon before the holiday. All preorders for the regular edition of X360 Mushihimesama Futari and roughly 5/8 of our preorders for the limited edition should ship out to customers tomorrow. The game was dispatched from Japanese distributors last night but one supplier whom we preordered the limited edition from did not receive their Futari LE allocation yet. They'll receive the game tonight. We're targeting Friday for the arrival of the remainder but please note that there may be shortages of the limited edition from the upcoming Friday batch. We'll update accordingly once we receive the shipment proforma. If Cave actually fills our entire original order, we'll be very surprised. «©NCSX» The good news was posted on Kotaku on Sunday morning and spread around the gaming internets like brushfire. Cave's making the upcoming Mushihimesama Futari v1.5 region-free and playable on U.S. Xbox 360 consoles. Shooters sell well for us but we also understand they're a niche product. Not everyone loves a shooter and that's okay. While a top-notch shmup like Mushihimesama may be positioned as a premium product in Japan that commands full price at retail, there's no way it'll sell at full price stateside because the "mass consumer" audience (read: Big-Box-Superstore traffic) isn't dedicated enough to support a shooter at US$60. Shoppers might consider a purchase if the price is at the magic level of $19.99 like Raiden Fighters Aces for X360. The operative word in that last sentence is "consider" since shooters are a tough sell in Shop-Mart-Land. One of our own examples we can throw out is Ikaruga on the Dreamcast. That was our best selling import game ever and NCS probably sold 35% of the entire production. It took us three days to process, pack, and ship all of our preorders. However, when Ikaruga was ported over to the US Gamecube in 2003, the overall sales numbers weren't great. We still had copies as of last Christmas although we did eventually sell out at US$80 per copy. We got more than full price... but we had to wait 5 years. «©NCSX» Cave's distributor started preorders for the Xbox 360 conversion of Mushihimesama Futari v1.5 last night and reservations are welcome for a regular edition of the game as well as a limited edition today. According to the preorder details, both versions of the game will include a bonus DLC card which unlocks Mushihimesama Futari rev1.01 which is basically Futari v1.5 with bullet patterns from Futari v1.0. Pilot Princess Reko atop her beetle Kiniro or a lad named Palm who rides a dragon known as Hirow and shoot at waves upon waves of insect attackers. The limited edition of Futari includes a 2-CD Mushihimesama Futari Arrange Soundtrack which is bundled with the game in a special slipcase. Preorder Price: JPY9200 or US$109.90 from NCS. Please note: The distributor included a precaution in the solicitation that preorders for the limited edition of Mushihimesama Futari may be cut by Cave. Sort of like the debacle that was Death Smiles LE. Due to this potential shortage, please be aware that the LE price may increase if we have to source the game from Japanese retail. Most Japanese Xbox 360 games are region-locked but Cave is making Mushihimesama Futari region-free and the game is playable on USA Xbox 360 consoles. This document and photos are ©NCSX 2008. All rights reserved. No reproduction in whole or in part of this document may be made without express written consent of National Console Support, Inc. The original Mushihime-sama was a fine shooter with an attractive heroine named Princess Reko who battled hordes of insects while straddling her beetle-steed Kiniro.